The front cover of the publication from 71 years ago price 6d (2.5p). In the last few days whilst preparing to put the Walsall Lives Calendar for 2009 onto the blog I came across a page that I thought warranted further investigation and explanation. It concerned the Council’s plans for redevelopment seventy-one years ago. In November 1943 the County Borough of Walsall produced a twelve page booklet telling of their vision for the future of the town. Included in the booklet were two large maps titled “Plan A” and “Plan B”, produced separately, folded and stored in a flap on the inside back cover. It is these two maps which will be of main interest to the readers of this post, don’t forget to click on the images as this will enlarge them. 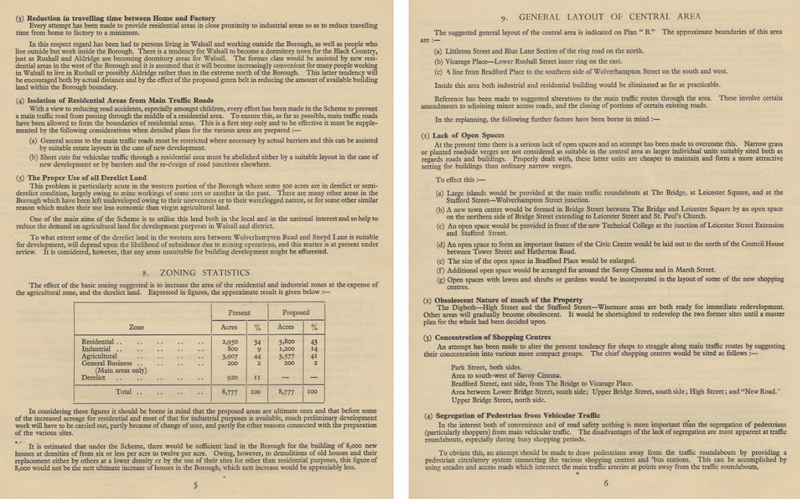 The booklet itself was printed by Alfred Huxley Limited of Darwall Street and the two maps were printed by another well-known company in the town up until a few years ago, the Walsall Lithographic Company Limited of Midland Road. 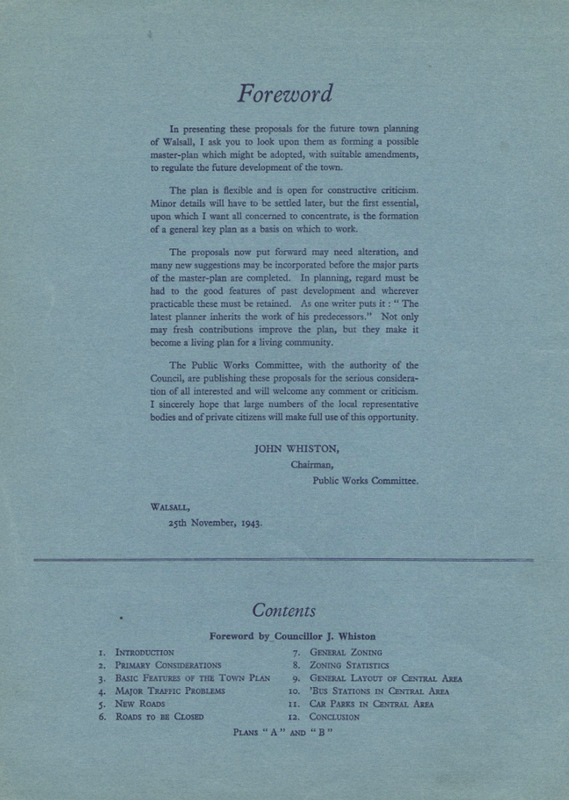 The scan left is of the inside front cover and it is interesting to read the comments of John Whiston, Chairman of the Public Works Committee. 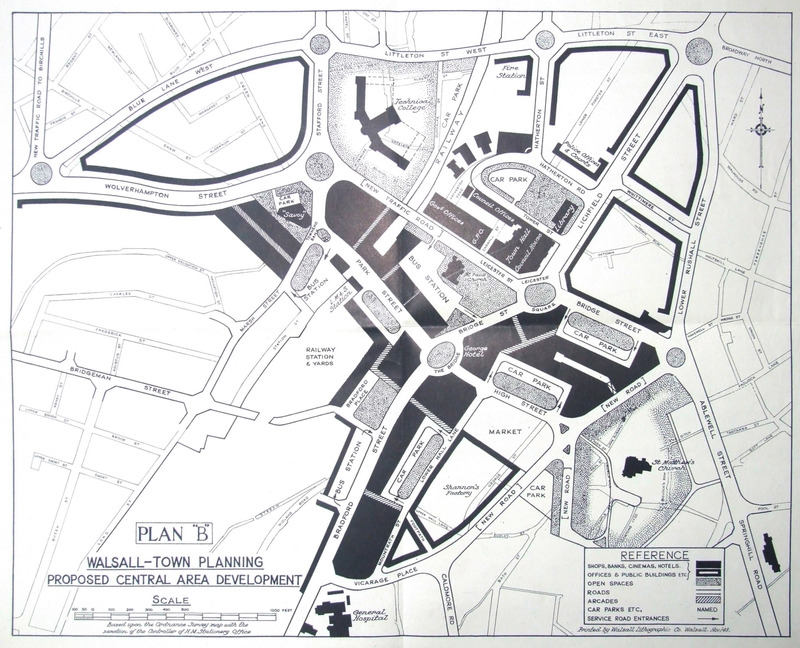 Reproduced below is the Plan B map which concerns the redevelopment of the town centre. The ideas put forward were quite radical in places, although many street names remain their configuration would be changed considerably in some cases. A new road, not a million miles from the new road opened a few years ago around The Ditch area, was due to be built, Peal, Dudley and Upper Rushall Streets would all have gone under these proposals. In the building of this road Freer and Goodall Streets were to be erased from the map completely and replaced with an area that would house banks, shops and hotels etc, as well as two large car parks! Shannon’s factory remained and so does the market but not as we knew it (note the past tense). The market would have been housed just OFF High Street on the area now occupied by George Street. Interestingly both the George Hotel and the Savoy Cinema remained as part of any future development. Of course we now know different! Note the inclusion on the plan of the “new” Technical College which lasted approximately fifty years and the site is now occupied by Tesco. Following this Plan B map are the eight pages of text explaining the intentions of the planners. Page 2 below raises some interesting points in particular the third paragraph of part one titled “New Roads – Western By-Pass”……. 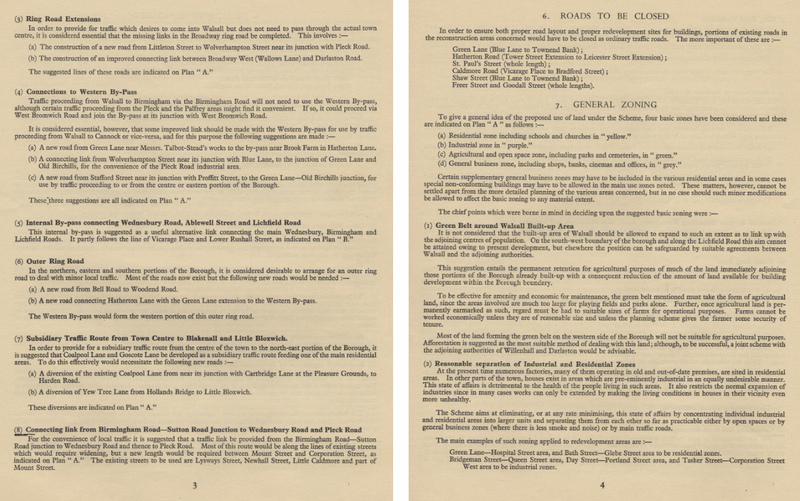 “near the Scott Arms and proceed via Bescot and Bentley Lane to Broad Lane, Bloxwich etc………”. Page 3 below contains some interesting points regarding alterations to the road network. Page 4 leads off with “Roads to be Closed”, read this to see which streets would have disappeared altogether. Page 5 below continues the text from page 4 titled General Zoning. Article 8 titled Zoning Statistics on page 6 gives a table of acreage for various types of land, residential, industrial etc. I particularly like the final item, Derelict and the “Proposed” column, it contains a hyphen……..does that mean zero? If so, that’s one they got wrong! 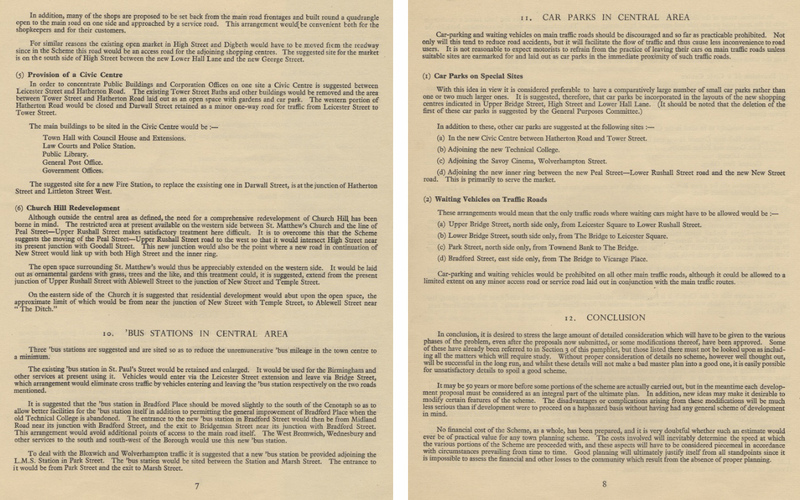 The final two pages of the publication, seven and eight, contain proposals for Church Hill Redevelopment and bus stations whilst the final page touches on car parks, waiting traffic and of course, the conclusion. Note the car park adjoining the new Technical College and the Savoy Cinema on page eight. The final illustration is the large map showing all of the Borough. The colour coding and its significance in conjunction with this map is as follows:- Orange is special traffic road, red is for first class traffic road and second class roads are shown in blue. This information is also on page two of the text pages above. 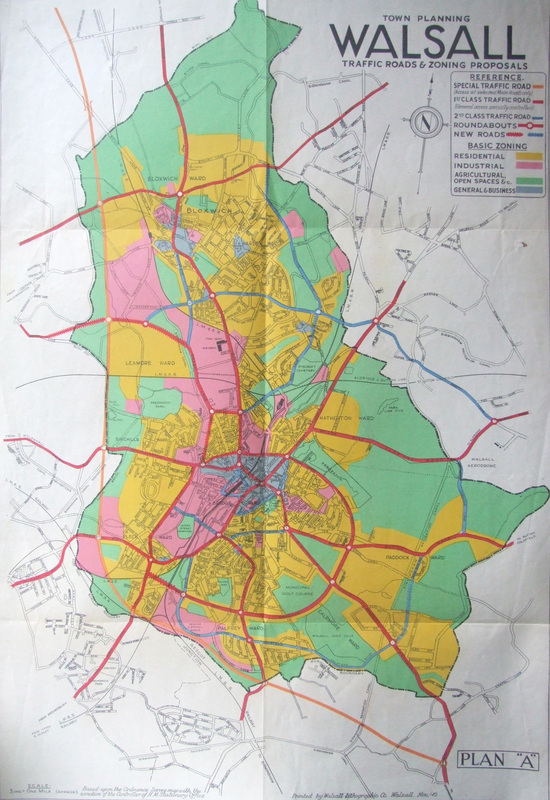 The areas covered in yellow indicate Residential, pink shows Industrial, the blue-grey colour shows General and Business areas and finally the green spaces show, not unsurprisingly, Green and Open Spaces. 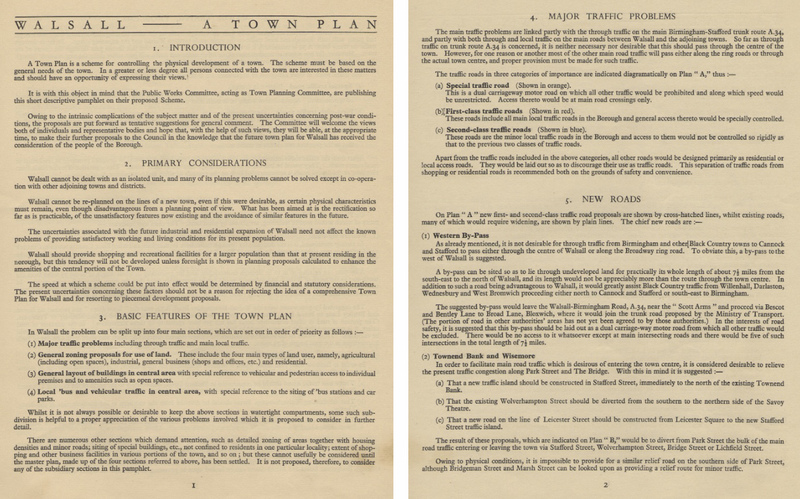 Now you know the intentions of the Public Works Committee in 1943, would the town be a better place if all of these plans had been brought to fruition? 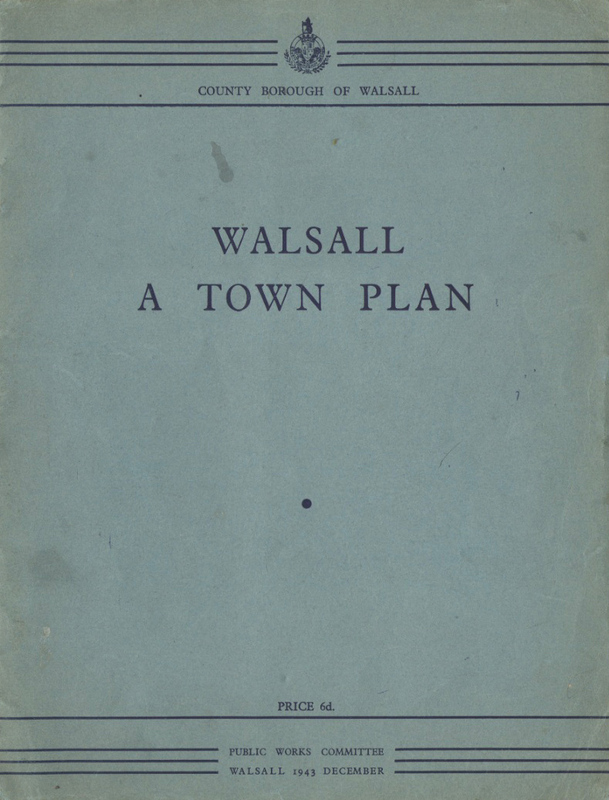 You are currently reading Walsall – A Town Plan – 1943 style at Walsall Life.